Shh…look…listen…to the sounds of the dark say Goodnight! What sails? What flies? Those…these, Down low, nearby, far off, up high. 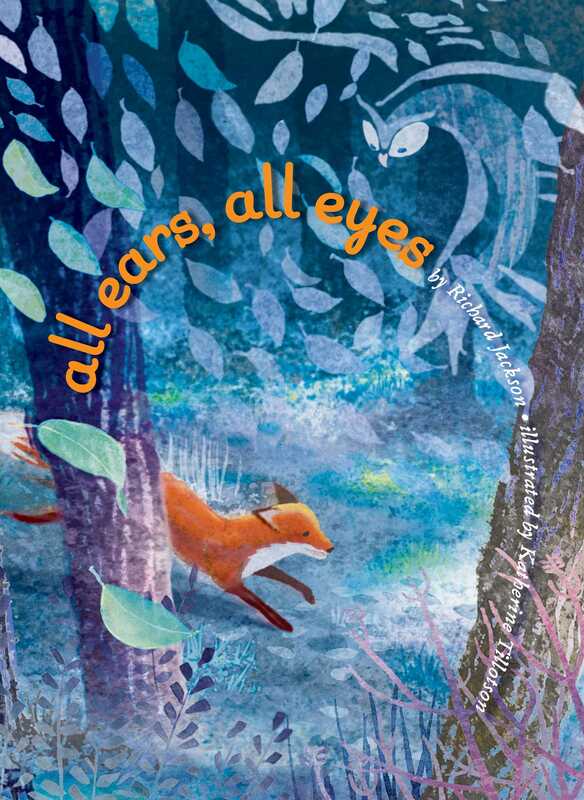 An homage to the melodies of nighttime, to each critter that sings, hoots, or glows, All Ears, All Eyes takes us on a moonlit journey where the landscape shimmers with Fantasia-like beauty. Where if you look and listen, you might spy an owl, a deer, a chipmunk—or—what else!—before falling asleep. This quiet book explores what happens in a forest as day slips into night. Under a full moon, the landscape glows, exposing various night creatures and their activities. The air above resounds with the hooting of owls and the whirring of bats. On the ground, other creatures stir. A porcupine "scoots between roots." Others prowl through the shadows, such as a fox, a deer, and mice. Others make no sounds at all, like the fireflies that fill the night with glowing lights. Jackson's sparse but sensory text entices readers' imaginations while sparking their curiosity. Its rich onomatopoeia adds to the story's enjoyment, while its quiet pace creates a soothing bedtime story for young readers. Tillotson's mottled illustrations that sneakily play with positive and negative space complement the text. Digitally worked watercolors hold on to the fading light, shapes morphing from page to page so that leaves become eyes; translucent print in varying typefaces and fonts floats on the page, in motion with the forest creatures. Readers will relish finding the veiled creatures in the darkening woods—both those that are mentioned on the pages and those that are not. In addition to fostering observational skills in young children, this book could also tie in well with primary grade environmental curricula. Dazzling. A forest night setting created with watercolor and digital techniques at first connotes quiet and stillness, but from beginning to end, this story encourages readers to look closer and listen deeper to discover a symphony of sight and sound. As the day starts to fade, an owl sits practically camouflaged in a tree, painted in the same blues and purples as the leaves. When night falls, the following pages repeat the technique, and many of the creatures cannot be seen until they, surprisingly and delightfully, become visible. This pairs well with the questions and cadence of the text (“What surprises? What sings? Crick-crick-crickets chirring in the thick-thick-thickets.”). There’s no need to fear the dark knowing that there’s such company stirring within it, and yet even with this noise and activity, the ending provides a gentle send-off to slumber. VERDICT This lovely, evocative selection is a guessing game and a soothing bedtime offering that’s perfect for reading aloud, especially to young animal and nature lovers.